I am always happy to try any novel that has been translated by Stephen Sartarelli or Don Bartlett. Even though Death in August did not seem to me to be a book I’d usually pick up, the translator and the lovely cover conspired to make me try it. And it is quite good, though not nearly as good as the cream of Italian crime fiction epitomised by, for example, Andrea Camilleri or Gianrico Carofiglio. The plot is both simple and slightly strange. Set in the mid-1960s, the book is about Inspector Bordelli of the Florence police. He’s at work during August, when the city is blistering hot and almost everyone is on holiday. At the start of the book he has two encounters which are rather clunky: one is a set-to with his boss (who is absent for the rest of the book) about Bordelli’s habit of letting poor thieves get away with their crimes because they only steal out of need; and the other is with a young recruit from Sicily, whom Bordelli soon identifies as the son of an old comrade in arms from World War Two. Bordelli becomes a mentor to the young man, and when a puzzling crime crosses his desk (or rather, wakes him in a late-night/early morning phone call), Bordelli asks him to assist. The case is that of an old, wealthy woman who has stopped answering her door. Her companion is very worried about her, so contacts the police. Bordelli goes to her grand house in the hills above the city to investigate, and finds her dead body lying in bed. At first it seems as if she has died of a severe asthma attack, but soon it is apparent that the death could not have been natural. Bordelli has to address this puzzling mystery to try to work out how anyone could have killed the old lady without keys or access to the house. In the process he meets her eccentric brother and her two nephews and their wives. The crime itself is firmly in the Agatha Christie mould. There are a small number of suspects, and Bordelli’s main task is to work out how one (or more) of them could have done it. When he has a flash of inspiration after a very drunken meal involving his friends, relations and a few friendly petty criminals, it is simply a question of working on the suspects until one of them caves in. The book is not bad, but it was not one that I could really take to, partly for the reasons mentioned above and partly because there is a lack of the charm in Bordelli’s character that is so evident in the irascible Salvo Montalbano (Camilleri) or the introspective Guido Guerrieri in Carofiglio’s books. Nevertheless, if you like a short read (of 200 pages) and a slightly formulaic crime novel set in a well-portrayed foreign land, this could well be a book for you. 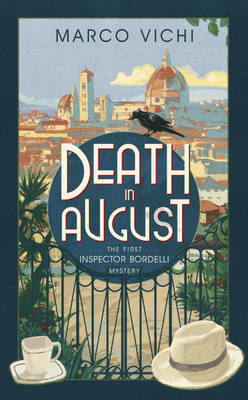 Death in August is first of a series which is very popular in its native Italy, so it is quite possible that the characters mature slightly (and become less stereotypical) in future installments, and that the memories of WW2 either become more realistic or fade out of the plots. I thank Karen of Euro Crime for my copy of this book. Other reviews of this novel are at: Euro Crime (Karen Meek), Random Jottings, and Italian Mysteries (website). Unfortunately, this is another occasion on which the translator of the book is not named on the Amazon listings by the publisher. Shame! * UPDATE!! Norman has kindly pointed out in the comments that the Italians changed sides in 1943. I don’t think this affects the basic point, though. Thanks, Norman, for the correction, much appreciated. An excellent review Maxine, even if I’m not very keen to read it. Darn it…I looked at the cover and thought YES I WILL READ THIS (my plan when I win lotto is to split my time evenly between Florence, Israel, Australia and ‘the rest of the world’)…but it sounds like I should give it a miss…don’t like people playing fast and loose with such major points of history. Oh, uh, my WWII false information detector is clicking away, and locates some suspicious events here. Italian Army soldiers were not the good guys, the allies. Oh, no, they helped Mussolini deport Jews from the Italian ghettoes. As soon as the historical accuracy is cleaned up, I’ll read it. Otherwise, it’s Camilleri, Leon and Carofiglio for me. And maybe some Sciascia thorwn in. All good. I agree it is ridiculous to portray the Italian Army as a brave fighter against Nazism, or a brave fighter against anything. The horrific losses Italy suffered in the Great War probably killed the best young officers, and many men who might have stood against fascism in the early 1920s. But incredibly there were some Italian navy war heroes in WWII, not many I agree. In a raid on Alexandria in 1941 Italian navy frogmen using manned torpedoes managed to sink two British WW I vintage battleships. Secondly, Italy had changed sides and imprisoned Mussolini in September 1943, before the fall of Rome on 5 June 1944. When Mussolini was rescued by German paratroopers he was set up in a puppet state in Northern Italy, informally known as the Republic of Salo. Italians then fought on both sides, and many Italian soldiers interned and shipped off to Germany died in concentration camps, or were massacred by the Nazis as in the book Captain Corelli’s Mandolin. Thanks, Norman, I’ve corrected the post. It could have been the author’s intention to make these two “heroes” partisans, I suppose, as there were some of those during the Mussolini years, but you would never gather that from the book – if you knew nothing about WW2 you would assume that the Italians were on our side….and loyal fighters of Hitler and Nazism. But thanks for your correction on my memory of when the Italians changed sides, Norman (not “my actual” memory but “my memory of hearing/reading about it”). Funny story about the Italian Navy torpedoes. As my Dad was in the Navy (the real one, ie the British Navy) during WW2 the Italian version always was the cause of great mirth in our house when I was growing up, if it was ever in the news for any reason. Maxine those few frogmen were probably the only competent members of the Italian navy. I can imagine your Dad laughing at the Italians. There was a cartoon in Punch in 1940 that showed an elderly Italian general running away from the British in the North African desert, as he sprinted past a young soldier also running away he shouted ‘You young men lack the speed of us old Caporetto veterans’. Caporetto was another Italian military disaster in the First World War, when the Germans broke through their front with ease and sent them scuttling back to the River Piave. Diana’s family were all in the British Navy, we traced them back to Trafalgar, until her grandfather was in Melbourne when WW I started, and switched over to the submarine force in Royal Australian Navy. There were definitely Italian partisans. Several of the Italian post-WWII movies show them, and the movie with Maggie Smith and Judy Dench — Tea with Mussolini, and Bertolucci’s 1900 are but a few that portray them. But many of the great post-war directors in Italy made movies about the war and showed Italian partisans. Also, in my travels looking for partisans, including Jewish people who had formed their own partisan brigades or joined others, I have found many in Italy. And I’ve also seen footage of interviews with Jewish partisans, who said they were treated the best by Italian villagers, farmers, than anywhere else. Yes, there were Italian partisans, and partisans in every country occupied by the Nazis I think – if this book had made it clear that Bordelli and his friend had been partisans then fine, but it does not, and many young people reading this book are likely to receive a false impression of Italy’s role in WW2. Glad for the warning. It would aggravate me now end to read a book which inaccurately portrays the Italian army as a “good” one, fighting the Nazis — when, in fact, Mussolini and his government turned over thousands of Jewish people for deportation. Thankfully, there were partisans all over Europe. I recently met an artist whose uncle died in the Dutch Resistance. and have read of women in the French Resistance, some of whom survived. And, knowing of Italian partisans, just gave a quick glance on the Internet only to find news of many Resistance groups in Italy. It’s good, gives one hope about humankind. Won’t bother to read this for the reasons you cite, but I do like that cover. It was the cover that sold me, Kathy, as well as Sartarelli as he does such a marvellous job with the Camilleri novels. Ditto. I love Sarterelli’s translations and his comments in the endnotes. His sense of humor is great, too. He has said that he laughs very hard when reading what Camilleri has written — while he’s working on translations. Ditto, I think I’d read anything Sarterelli translated. And so I have mixed feelings about the book also. The sexual initiation which Maxine diplomatically described as “yukky” is a graphic, forensic description of child abuse. I realise this is a work of fiction, but it jarred. The fudging of WWII history was unpleasant and confusing. But the characters, the setting, the food and the echos of Magdelen Nabb’s Marshall Guarnaccia series are a delight and, on balance, I’d read the next book when it comes out. This is all documented in the Wikipedia article with proper sources. Until this time, moreover, the Mussolini family employed a Jewish nanny for their children (one of the reasons Il Duce resisted Hitler’s bizarre racism), and there had been more than a few early supporters of Fascism among Jewish industrialists from the Turin area. By the time the Nazis ressuscitated the defunct Fascist regime in 1943, however, Mussolini’s reservations about such German policies appear to have disappeared, and at any rate he was powerless to do anything about them. All the same, even ater the Nazi occupation of Italy, there was still considerable resistance and obstruction, often with the Fascist apparatus itself, to the implementation of such policies inside and outside Italy. (For sources, see, for example, the Italian chapter in Hannah Arendt’s famous “Eichmann in Jerusalem, An Essay on the Banality of Evil,” and the 1987 documentary film by the Israeli Joseph Rochlitz, “The Righteous Enemy”.) This is not to say there weren’t Italian Fascists who collaborated in implementing the “Final Solution.” There were the infamous Brigate Nere (the “Black Brigades,” which figure in the third of Marco Vichi’s Bordelli novels, “Il nuovo venuto,” who were particularly fierce. It is simply to say that the author’s portrayal of the rather complex historical situation is actually quite accurate and nuanced, and that the Italians who helped the Nazis in their campaign of extermination were by far the exception and not the rule. Thank you so much for taking the time to reply, Stephen, at such length and so informatively. We had worked out that the “pro Allies” storyline was post 1943. Nevertheless, on reading this book, one would not get the impression at all that the Italians were on the same side as Hitler for the first few (crucial) years of the war (in which my father served). I do feel that the novel is (by default) misleading in this respect – but of course English-language -only readers have not yet had the chance to read future volumes. “……..Italians were on the same side as Hitler for the first [crucial] years of the war [in which my father served].” Well said Maxine. Would Italy have changed sides without El Alamien, Operation Torch, the fall of Sicily and the Allied landings on the Calabrian toe? Some Italians must have supported Mussolini because he ran the country from 1922 till 1943. Thanks for that link to the Holocaust research project, Norman, which accords more with what I’ve been told by the people involved & who lived through it, than Wikipedia! Yes, I suppose that in the absence of context, the wartime experiences described in the book could be misleading to foreign (i.e. non-Italian) readers. Vichi does presume a certain familiarity with the historical circumstances on the reader’s part, but I think he can be forgiven this shortcut, since one normally writes for one’s compatriots above all, and most Italians are familiar with the internal struggle against Fascism that came to the fore after the Armistice of September 8, 1943. Upon first reading this series I myself thought the war flashbacks were a bit overplayed by the author, but I have come to accept and appreciate them. I think Vichi’s point is that a police inspector in late middle age in the 1960s would most certainly have vivid memories of the war, whatever side he’d been on, and since his character has left-wing sympathies, it is natural that he should be involved in the fight against the Fascists and Nazis. I also think that by having Bordelli be so insistently preoccupied with these memories, the author is giving us a portrait, from the inside, of someone suffering from what we now know as Post-Traumatic Stress Disorder. And we shall see in other episodes that he is not the only one. A final note, Maxine. I feel I should point out that the link provided by Norman in no way contradicts anything I said in my initial post, but actually indirectly confirms it. As for what I and the Wikepedia article say about the supportive role played by some prominent Italian Jews in the early days of Fascism, this is common knowledge to anyone familiar with the Italian social history of the time. Many volumes have been written about it and about Mussolini’s own initial opposition to Hitler’s racism and anti-Semitism (one that comes immediately to mind is the biography of Mussolini written by Laura Fermi, herself Jewish and the wife of physicist Enrico Fermi, who left Fascist Italy). I cited Wikipedia simply because of its succinct, readily available and, as I mentioned, well-documented summary of the facts in this case (here is the link: http://en.wikipedia.org/wiki/Manifesto_of_Race). And I did this merely because one of Kathy D’s comments above seemed to confuse the issue, associating the Fascist regime directly with Hitler’s Final Solution, and Marco Vichi’s omission of any mention of Italy’s alliance with Nazi Germany as somehow obscuring this simplistically reductive association. Do note, too, that the text of Norman’s link, the holocaust project’s entry on the fate of Italian Jews, cites only German officers in the conduct of operations of deportation, thus confirming my assertion of the overwhelmingly German nature of the carrying out of the Final Solution on the peninsula. It also confirms the other principal point I made in my initial post. Indeed, its summary of the implementation of the Hitlerian policy begins with the fall of Fascism at the Armistice, the German occupation, and the propping up of the Republic of Salo’, just as I had said. Thus I really don’t know why Norman posted that link. As for the sources I cited in support of my assertion of internal non-Jewish Italian resistance to the Final Solution, I should hope that Hannah Arendt is unimpeachable, yes? And I highly recommend that film by Rochlitz. I have no illusions about the horrors of Fascism, not least because my personal family history is deeply scarred by its excesses (I am the first-born of my family in the U.S.). It includes, among other things, the brutal imprisonment of my maternal grandfather, a journalist, by the regime, and the death of his wife, my grandmother, of a stroke at age 47 during the period of his imprisonment, when their sons were in hiding to escape arrest for simply being the male offspring of a dissident journalist. But the facts are the facts. Speaking of which, while I normally would not question Norman’s knowledge of military history, which appears clearly much broader than my own (I’m afraid I share the congenital Italian aversion to things military), I am keen to point out that it was not the Germans who broke through the lines and routed the Italians at Caporetto, but the Austrians. As for the actions of the fictional Bordelli’s real-life San Marco Regiment against the occupying Germans, those are indeed based on fact, though I think I would agree with Norman that they are probably exaggerated. Thanks again, Stephen, for taking the time to comment. Your knowledge of Italian WW2 experiences are clearly not only greater than mine but much more personally scarred – what a deep tragedy within your family. Of course, in Britain we were not occupied, and this makes our experience and perspective rather different. My mother’s family included some Polish people (by marriage) who suffered dreadfully (and their families) under the Nazis. My husband’s father was a POW of the Japanese almost immediately after he disembarked, and suffered all his life thereafter as a consequence. It was a terrible time for so many. Your comments about post-traumatic stress disorder are interesting, I had not seen the character in that light but it does make sense now that you point it out. As you say, Vichi did not (presumably) write his book for an English-language readership and I should perhaps have been more aware of that in my review, which was from the perspective of a particular view of Italy’s role in the War. Personally, I prefer Camilleri’s books as a reader, and am in complete awe of your magnificent translations of those. Thanks, Maxine. Yes, the horror stories abound when it comes to war, don’t they. You’d think we would learn, but no. Where will it be next? Iran? Syria? At home? You never know. That’s the problem when you let the genie out of the bottle. Incidentally, I too prefer Camilleri, as a translator. Even Vichi would probably agree. Stephen, I am so sorry your family suffered terribly under the Fascist regime, and I think we are all on the same side in this debate. My father’s younger brother was an officer in the Allied army that liberated Italy from Fascism and the Germans. I am a huge fan of the Camilleri books and of your superb translations, but I do have to insist that it was the Germans [deployed to strengthen the Austro-Hungarian Army] who routed the Italians at Caporetto. A young Erwin Rommel won the Pour la Merite at Caporetto, and I can remember reading a few years ago about the battle in The White War [War on the Italian Front 1915-1918] by Mark Thompson. In Britain we constantly see in films and books the war effort of our parents and grandparents sidelined as we are told that the war was won by the Russians and Americans. It probably was, and we are grateful, but there would not have been a war to win without the stubbornness and bravery of the British and Commonwealth forces in 1940 and 1941. Oh Maxine! Your November 4 comment says “Of course in Britain we were not occupied …” My family is from the Channel Islands. Enough said?